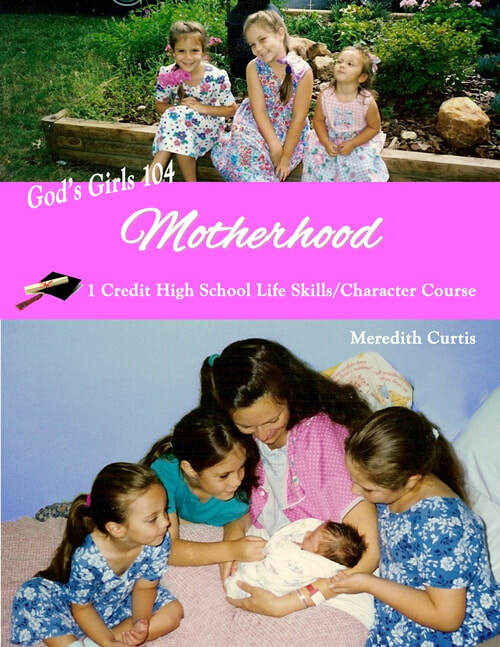 God’s Girls 104: Motherhood is a one-credit high school life skills course to inspire and equip young women of God to be godly mother in the future. Young women will do word studies in the Bible, read living books, enjoy hands-on projects, and serve as a Mom’s helper once a month. Daughters meet with Mom once a week for discussion, clarification, and prayer. Students will read inspirational classics that will impact their walk with the Lord. In addition, teens will memorize Isaiah 49:14-16 and Isaiah 40:11, create a “When I Grow Up, I’m Going to Be A Mommy” booklet for little girls, and write an essay. Pastor Mike and Meredith use the Holy Bible and other living books to teach life skills and prepare their teenagers to be joyful and successful adults with healthy relationships. Originally designed for their children, and later for close friends and church members, this class uses the mentoring style of teaching. Moms meet once a week for mentoring time. The goal: to prepare them to live godly lives now and in the future when they are adults working, studying, enjoying marriage, and parenting. You can purchase the print version of God's Girls 104: Motherhood at Amazon.